We don’t usually think of Navajo jewelry as being made of gold. But, by a few talented, and lucky, artists, it is. The work is rare, it is unique, and, while sitting at Twin Rocks, Robert Taylor tells us how he makes amazing jewelry out of silver AND gold. Get lucky, and hear it from a pro. Perhaps it’s the friendly, small-town feeling. Maybe it’s the way you’re transported when you see the nearby petroglyphs, and you imagine how people lived here over a 1,000 years ago. It might be the serenity and calm you sense when you discover the Milky Way on a clear night, the sky more brilliantly lit with stars than you, perhaps, have ever seen it. Or the freedom you experience as you take in the magnificent panorama of the nearby Muley Point overlook. The Navajo word, “Hozho”, may explain it best. Hozho is the most important word in the Navajo language. It means peace, balance, beauty and harmony. To be “in Hozho” is to be at one with, and a part of, the world around you. Consideration of the nature of the universe, the world, man, the nature of time and space, creation, growth, motion, order, control, and the life cycle, all expressed in terms quite impossible to translate into English. We hope you feel this connection and come to discover Hozho when you visit Bluff. This well-documented work, beautifully illustrated with over 100 full color photographs of baskets, weavers, and related objects, details the history, origins, and meanings of these creations. Included are detailed color photographs of vintage and modern baskets, portraits of award-winning basket weavers and their work, a section honoring a new generation of Navajo weavers, tips about the etiquette and safekeeping of ceremonial baskets, in-depth interviews with Navajo medicine men, and colorful takes of Kicking Rock Man, Changing Woman, Monster Slayer, and their role in the origin of the baskets. Don’t wait, get this book! It has it all going on, and it’s also available on e-readers. Bigfoot Spotted on the Navajo Nation! The Navajo Indian reservation is home to many amazing creatures. One of them is called The Howler. It is a mysterious being believed to have killed dogs and livestock. Elders in the community call these predators Skinwalkers, and others call it the Navajo version of Bigfoot, particularly news people. The Diné are ancient people with a multi-textured history and tradition. They believe they were created from Mother Earth and Father Sky. They are a part of the land, a part of their weaving, and a part of their Mother’s beauty. And, every Indian nation has its unique story of catastrophic contact with the expanding European settlement of the continent. The Cherokee, Choctaw, and Seminole nations walked a Trail of Tears in 1838 when forcibly removed from their homeland. Tens of thousands of Indigenous people have died in forced “relocations” and environmental desecration that drove them from their homes. General Carleton’s failed utopian agrarian experiment at Bosque Redondo with the Navajos during resettlement, like others, was a disaster. The Navajos were taken from the protection of the four sacred mountains. Many say that the Navajo people ceased to perform many ceremonies during the time of their captivity at Fort Sumner. And, many remembered those four hard years of the “Long Walk” as an event with as much significance to the Navajos as the Civil War was for other Americans. Twin Rocks is honored to learn from their resilient and humorous spirits and from the beauty they create. The film uses artwork / firstpeople.us : “The Creation” – Richard Hook “A Navajo Wedding” – Alfredo Rodriguez Photo credit to: Harold Carey Jr. / navajo-arts.com, old-picture.com, Google. When a Belt is more than a Belt! Allison is an extraordinary Navajo artist who lives down near Albuquerque. He goes by his middle name, Snowhawk. We are overjoyed when he visits, and are blown-away by his art and his technique. Here he have Steve Simpson, of Twin Rocks, showing us this extraordinary, and one-of-a-kind, piece of wearable art. The Navajo have made pottery in the Southwest since their arrival here sometime around the 16th century. But, because people have made pottery since about the beginning of time, it’s a pretty sure bet that they brought pottery with them during their migration. The Navajos made both plain and decorated pottery, and the plain is usually considered to be their old-style. 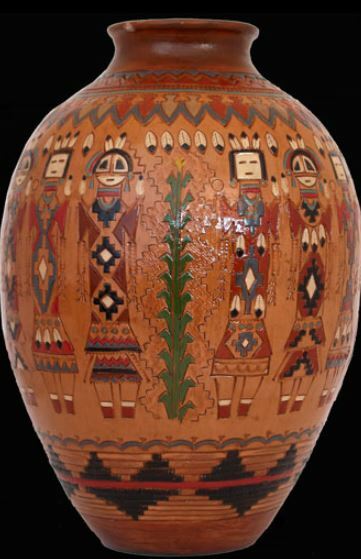 Navajo pottery is often pear-shaped, conically bottomed, and colored in a reddish brown. It is serviceable and made waterproof by coating it with resin from pinon pine. (Put your nose to the rim and inhale — the smell still lingers, and it is heavenly.) Once the resin permeates the clay, the pot can be placed in hot coals with no loss of the resin or its sealing properties. The decorations are simple beading or applique. If the pot has the clay beads or fillets, a space or spirit break is included. It might appear as if the potter forgot to include one fillet — no, it is a mystic and intentional part of the design. Anasazi culture potshards are ground and used as a tempering agent. The pot is built by coiling, shaped by hand with a corn cob and fired in an open pit. The Wedding Vase, and other styles of vases, are the most popular and they make unique gifts. Navajos also create large jars, but they’re rare — usually the pots are under 12 inches tall. The love of Navajo pottery has recently surged, a happy event for all. Appliqued decorations include yucca plants, cactus, horned toads, animals, humans, and flowers. Collectors love them, and so do we!